The St. Louis Blues are fighting for playoff position, but they also had to make sure one of their players met a very important threshold. Jordan Binnington, who has taken over the crease for the team this season needed to hit 28 games played in order to avoid becoming a Group VI unrestricted free agent. This kind of unrestricted free agency occurs when a player age 25 or older sees his current contract expire without getting into enough NHL games. Binnington had zero games under his belt before this season because his only previous appearance—way back in January of 2016—hadn’t been for 30 minutes of ice time. As of today, Binnington has just 26 appearances under his belt and would need to play in at least two more games for the Blues under normal rules in order to avoid becoming a UFA this summer. Interestingly though, Andy Strickland of Fox Sports Midwest reports that because Binnington signed his first entry-level contract in the lockout-shortened 2012-13 season, his requirements were dropped to 26. That means Binnington will now become a restricted free agent at the end of this season, even if he doesn’t play in another game for the Blues. It was unlikely that Binnington would have been held out for every remaining Blues game, given how well he has played. The 25-year old netminder leads the league with a 1.79 goals against average and has a 19-4-1 record on the year. That’s because of his crazy .929 save percentage that includes five shutouts. Still, he could have suffered an injury at any point that would have ended his season and allowed him to hit the open market in a few months. 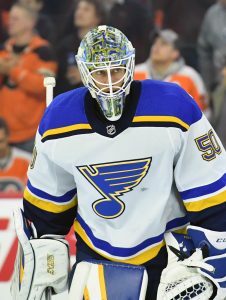 The Blues have a tough decision on what to do with Binnington now, as though it’s easy to want to sign him they still have Jake Allen under contract for two more seasons at a $4.35MM cap hit. If they want to lock up Binnington on a multi-year deal they’ll likely have to give him a bit more money, but luckily he now actually won’t qualify for unrestricted free agency until the summer of 2021. He will however have arbitration rights this offseason. As an Allen owner in a salary cap league…what do I do?? Gavin! “.179 goals against average” (?) Currently, 1.79!